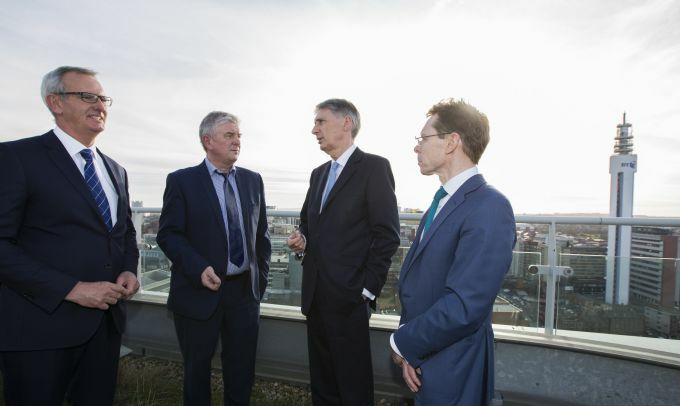 The Chancellor of the Exchequer, Philip Hammond, dropped in to check progress at Birmingham’s Three Snowhill, the day after he delivered his Spring Budget. The visit was part of the chancellor’s tour of the Midlands to promote the Government’s £500m investment in the Midlands Engine. He was joined by West Midlands mayoral hopeful Andy Street. At 420,000 sq ft, Three Snowhill is the largest single office building under construction in the UK outside London. The £200m development is the third and final office development on the four-acre Snowhill estate and is scheduled for completion in 2019. The duo undertook a tour of the site accompanied by Richard Probert of Ballymore, the developer behind One and Two Snowhill. The 17-storey development is being funded by M&G Real Estate.